The Stainless Steel RIBBON BLENDER is an best efficient and versatile product blending machine for mixing of dry granules & powders homogeneously. Approx two third of the product volume of the container of Ribbon Blender is filled to ensure proper mixing materials. Abster Equipment Ribbon Blender gives best super result for mixing of product like dry powder & granules due to the design and shape of the materials mixing ribbon and product container. Material should be charge from the top side. There are Open lid or port/ports should be provided on the top cover to charge the product material as well as for air vent. Our blender machine with One discharge valve provided at the bottom side at centre of the container. 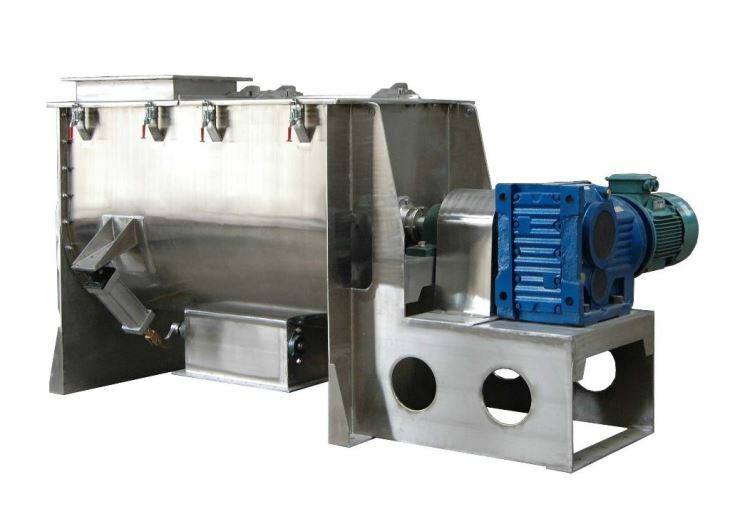 The blender machine discharge height could be adjust as per the customer requirement, so that product material gets discharge in the other container directly or fixed screw transfer or vacuum transfer systems optionally extra so that product material handling time for discharge is nil and the operation is dust free. In Ribbon Mixer Blender machine the powder moves from centre to the end of container and end of container to the centre of container or bins. Requirement of total mixing time is very less and the RPM required are also very less , The intense mixing movement shortens the time of mixing, faster and more efficiently. Even if the material has a specific gravity. The product material gets sufficient continuous movement due to the U shape & movement of multiple ribbon & U shape of the container, which moves material for good quality of product blending and discharge from bottom .Machine with heavy duty worm reduction gear box with belt drive with motor, blender with couple drive gears to main ribbon for mixer stirring. blender Container with Bottom materials discharge valve & Top cover provide. The Ribbon Blender Mixer unit is consist of electrical motor, worm reduction gear, belt drive or heavy duty chain between motor and gear, couple drive between gear to ( ribbon ) mixing stirrer. Product Container having four nos. of legs with discharge valve & top cover of machine, Both end of mixing shaft is sealed with bush & PTFE gland housing & safety guards are provided on all moving parts for safety. Ribbon blender During the rotation of the stirrer, Sanitary design-heavy gauge, stainless steel construction. As the product gently moving while the ribbon stirrer rotates, the large heating surface area presented by the internals of the cylindrical shell ensures uniform drying of the product. A fresh layer comes into mixing ribbon unit with contact indirectly heated walls of the shell when the diffusive action is induced by the mixing stirrer mixing constantly. Two Type designed of shell 1. Cylindrical type and 2.”U” shape. Optionally – Inline milling and loading with vacuum powder transfer systems. For Jacketed mixer with Temperature controls, and Over voltage load protection with Emergency stop. Heavy duty Design is cGMP- Current Good Manufacturing Practices compliance. All contact parts stainless Steel 316 or 316L & non contact parts AISI 304. Quick and Fast and uniform mixing & draying at low temperature. Heating media can be used steam/ hot water / hot oil.